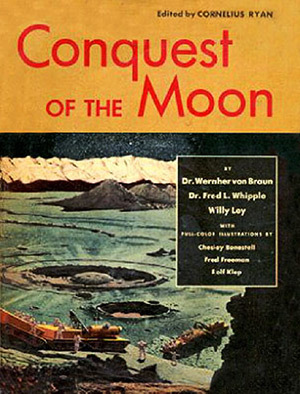 Author: Wernher von Braun, Willey Ley, Fred Whipple. Edited by Cornelius Ryan. This is the second in a set of three books that are expanded treatments of a series of articles that appeared in Collier’s magazine beginning in 1952 (for more background information see the review of the first book, Across the Space Frontier). 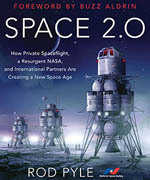 This book describes in detail a rather ambitious 50-person first lunar landing and exploration mission based on an already-existing infrastructure (described in the first book) consisting of an 80-person space station and a fleet of 15 fully re-usable 3-stage rockets, each with a 36-ton payload capability. The book considered it technically feasible to accomplish a lunar mission of this type by 1978. It makes for fascinating reading how the best scientific and engineering minds of the early 1950s envisioned the first lunar landing expedition. Three moonships would be assembled in Earth orbit next to the space station over a period of eight months. A total of 360 flights of the re-usable 3-stage rockets would be required to bring up all the materials, supplies, and crew – 346 of these flights would bring up only propellants! The three moonships are each 160 feet long, topped by a personnel sphere containing five decks. The personnel spheres would be constructed first so they could house the construction crew for the rest of the construction phase. All three ships would have crews, but one of them would carry only supplies and equipment (no return fuel) and would stay permanently on the surface of the Moon — it’s crew of 10 would be divided among the remaining two ships for the return voyage. Each personnel sphere would be capable of holding all 50 crew members in the event of an emergency. The ships would take five days to reach the Moon after leaving Earth orbit, dropping their departure fuel tanks along the way. They would land directly on the Moon (at Sinus Roris) without going into lunar orbit first, and stay on the surface for six weeks of lunar exploration (which would include one 14-day lunar night). The hold of the cargo ship would carry two modules that would be used for a lunar base. The modules would be removed from the ship with a crane and lowered into a suitable crevice for protection from radiation and meteoroids (finding a suitable crevice strikes me as a risky venture — it supposedly was to be located from orbit on a previous manned circumlunar survey mission). The modules contain just enough supplies for the six weeks. There is no mention of possibly re-using the modules on a later mission. For the first two weeks, exploration would be limited to a 10-mile radius of the lunar base. Then, five days before the end of the lunar night, two tractors (in case one broke down) with five people each would start a 195-mile circuit to explore the crater Harpalus. At night, the tractors would make their way slowly with the aid of the bright Earthlight supplemented with searchlights. During the day, they could go faster. Mountain-climbing equipment would be brought along in case it was needed! The cost of this ambitious venture was estimated at a rather unrealistic half billion (1953) dollars (60 percent of which would be for propellants), not including the already-existing infrastructure of the space station and re-usable launch vehicles. Suppose we turn up a great store of raw materials; maybe then we’ll want to recommend setting up a permanent community. We can make it practically self-supporting, securely encased inside a great plastic dome with its own synthetic atmosphere. Such an establishment could serve as a superb scientific laboratory — especially for astronomy and for research work requiring a vacuum; or as a springboard for further ventures into space. If we can manufacture our own fuel on the moon, which is a possibility, we can make tremendous savings in the launching of a spaceship. That is an ambition still worth pursuing. 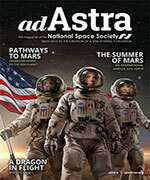 See review of third book in this series, The Exploration of Mars.